For example, say you have a product listing of widgets - and next to each widget is an "edit" link that would open a modal jquery window with some form fields on it - populated by a CFC from a db query and then updated via a CFC from the modal window which then closes on update. This seems like a pretty good "real world" tutorial but in just browsing through your stuff, and plenty of other sites, I'm not seeing one that really explains this concept. So - there are obviously a thousand different ways we could implement something like this. Here is an example I came up with. I began by creating a simple, static ColdFusion script that did nothing (nothing Ajax-y anyway) at all. I run a quick query against the cfartgallery database and display each piece of art. I display the name, price, and description for each one. Here is a quick screen shot so you can see what I mean. Admit it - you love my design, don't you? I call this the "Sickly Green" theme. Anyway, I always try to start simple and then progressively add to it. So let's look at the first iteration of my solution. Ok, we've got a lot going on here new so let's tackle it from the top. You will notice that I've added both jQuery and jQuery UI. jQuery UI will be used for the dialog control. So the next thing we need to do is create a dialog. This will hold the form that we will use to edit the art piece. Now stay with me here as we are going to to back and forth a bit. I need a way to get the data, right? Well I can use jQuery selectors filtered by the current selector (the div you clicked on) to get the information. The name is in my h2 tag. That's easy enough to get. My price is a bit more tricky. Did you notice how I used dollarFormat? I don't want the "pretty" value but the original value. 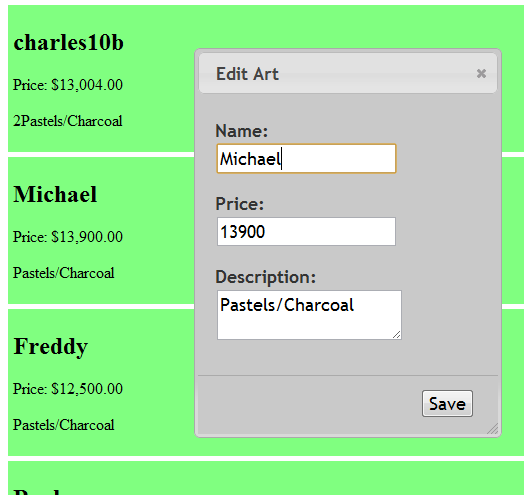 So I added a data-price attribute to my paragraph tab and fetch it out using jQuery's data function. Finally the description is fetched via the last paragraph. Three different examples and again - you could do this any number of other ways as well. So once we have the values, we can then launch the dialog. If you scroll to the bottom of the page you will see a hidden div there with the form. I set the form field values and than use the dialog() function to show it. I love how easy jQuery UI makes things for me. Note I also added a Save button. It isn't doing anything yet but I can confirm it is firing with a console message. Ok - hopefully you are with me so far. Here is another screen show. Alright - now let's kick it up to 11. So far we've gotten a dialog form working. It's dynamic so that the values you see in the dialog are dependent on the piece of art you click on. We've got a save button but it isn't doing anything. To complete the application we need to send the form data to the server and update the display. Here is my third and final iteration. And that's it. I'd put up a live example of this but I'd have to worry about spammers hitting the edit field. I did zip up all the files (including the CFC if you want to see it) and attached it to this blog entry. Enjoy!